For sleeping bags immerse item(s) in hand hot water in a bowl or bath tub. Apply by hand, agitate and leave to soak for 5 to 10 minutes. Rinse under running water, drain and gently press the sleeping bag to expel excess water. To dry, and only if care label allows, spin dry 3 times and tumble dry on a high setting until all ‘clumps’ have disappeared. Use clean tennis balls or trainers (that won’t melt) in a clean pillow case to help break up clumps when drying. 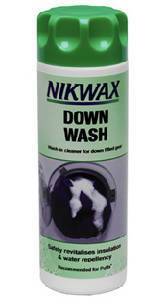 This product can also be applied neat to fabrics as a stain or grease remover prior to washing.